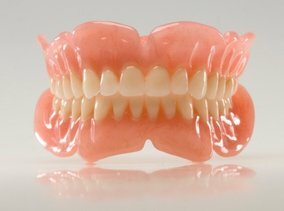 Even though dentures are not real teeth you should care for them like they are. You should brush them to remove plaque and food particles before removing your dentures. After they have been removed you should place them directly into room temperature water or a denture cleaning solution. Never use hot water because it could warp the dentures. Your dentures are delicate, so make sure you are careful when handling them so you don't drop them. Also, never try to adjust your dentures yourself. You could ruin them, so you should always seek assistance from your dentist if they feel uncomfortable or loose.